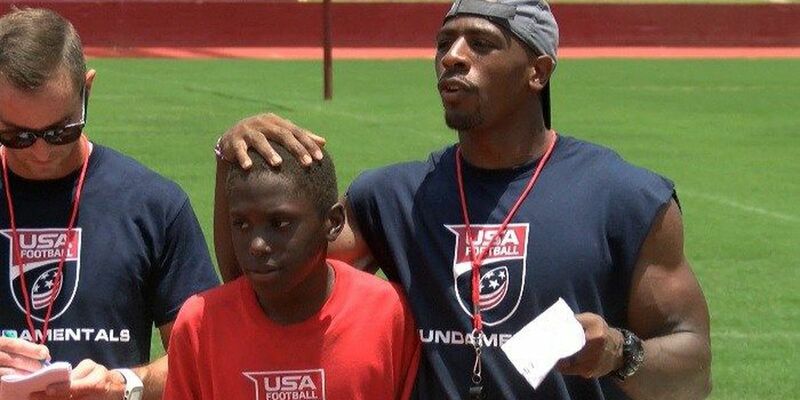 LAUREL, MS (WDAM) - Even the mud couldn't slow down the 100 campers who made their way to Laurel High School for the third annual AD 47 Football Leadership Academy, hosted by former Golden Tornado and NFL safety Akeem Davis. "The game of football is a kid's game," Davis said. "You see grown men out here running around like they're children so it's a kid's game. No matter what the elements are we're going to do what we need to do to make it successful." When Davis started the Football Leadership Academy three years ago he wanted to emphasize the word "leadership" when teaching campers the game of football and lessons for life. "We instill in these guys the core values," Davis said. "You got to have great character, great leadership ability, you have to finish what you start and most of all you have to have grit man. Stick-to-itness because life is rough." Perseverance is what helped Davis get from Laurel to the NFL. After leading the Golden Tornadoes to the 2007 state championship as a quarterback, Davis was overlooked by a number of Division I football programs. After spending a season at Jones County Junior College, Davis transferred to the University of Memphis where he would eventually earn a degree. Despite going undrafted in the 2013 NFL Draft, Davis overcame that obstacle by signing with the Washington Redskins the following year. "I had to go to the University of Memphis where I was always buried on the depth chart," Davis said. Second, third on the depth chart until we put the pads on. I'm still climbing that battle and I tell these kids about the five pillars that I'm actually living on a daily basis." A free agent this summer, Davis will try to fight his way back into the NFL. He'll be inspiring others in the process, especially those in his hometown of Laurel. "This camp right here means so much just because you have one of your own that came from the same environment you came from that made it to the level we all dream of," said USM sophomore quarterback Keon Howard, who helped Laurel to the 2015 state title. "We all need somebody to look up to and we all need a great role model. Akeem is one of the great role models for our time."